Our mission is to educate individuals and organizations in self care and healing their physical, mental, emotional and spiritual selves in order to reach their full potential as human beings. We aim to empower, guide, and teach stress reduction tools and techniques, healthy lifestyle choices, environmental cleansing and detoxification techniques, mental-emotional balancing and spiritual balancing. Learn what foods are good for you. Find the proper balance of supplements for YOU! The energy work I experienced on the Life Machine was truly transforming. I was dealing with a lot of physical and emotional things due to a car accident and a flu virus. Louise worked on my immune system, kidney, brain, hormones, digestion and emotional issues this past Sunday. That evening I was so calm and anxiety-free that I was able to sleep the entire night. In the morning it felt like something had greatly shifted in both my body and spirit. I felt clear, able to enjoy my meals without a lot of bloating and gas, and had my energy back! I was very impressed with Dr. Swartswalter’s comprehensive approach. In just a couple of treatments, she helped me refocus and stay emphasized on the essentials to bring my health and life into balance. 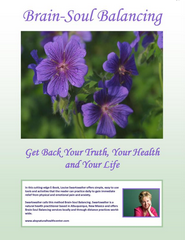 Her methods prove ailments are not just about health but about well being as well. Since we worked together recently, I have been in a magically different place. I have been sleeping very well…almost like I’m trying to catch up. Every one of the supplements you tested me for and recommended has done a wonderful job. There has been no reaction to any of them. I’m most grateful to you! Enter your name and email to receive this complimentary E-Book. Please do not ever stop carrying the Stable Glutathione . It has helped my health so much! After the clearing, I felt amazing, clear, happy, calm, attractive and responses from those around me more positive. Disclaimer All material herein is provided for informational purposes only and may not be construed as personal medical advice. No action should be taken based solely on the contents of this information; instead, readers should consult their doctor on any matter relating to their health.